NASA's Fermi Gamma-ray Space Telescope has identified the farthest gamma-ray blazars, a type of galaxy whose intense emissions are powered by supersized black holes. Light from the most distant object began its journey to us when the universe was 1.4 billion years old, or nearly 10 percent of its present age. 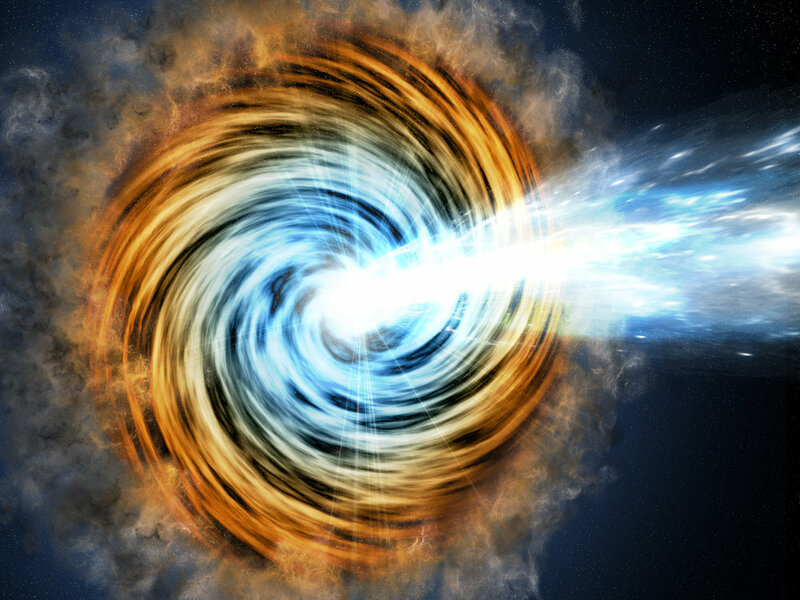 "Despite their youth, these far-flung blazars host some of the most massive black holes known," said Roopesh Ojha, an astronomer at NASA's Goddard Space Flight Center in Greenbelt, Maryland. "That they developed so early in cosmic history challenges current ideas of how supermassive black holes form and grow, and we want to find more of these objects to help us better understand the process." Blazars constitute roughly half of the gamma-ray sources detected by Fermi's Large Area Telescope (LAT). Astronomers think their high-energy emissions are powered by matter heated and torn apart as it falls from a storage, or accretion, disk toward a supermassive black hole with a million or more times the sun's mass. A small part of this infalling material becomes redirected into a pair of particle jets, which blast outward in opposite directions at nearly the speed of light. Blazars appear bright in all forms of light, including gamma rays, the highest-energy light, when one of the jets happens to point almost directly toward us. Then, in 2015, the Fermi team released a full reprocessing of all LAT data, called Pass 8, that ushered in so many improvements astronomers said it was like having a brand new instrument. The LAT's boosted sensitivity at lower energies increased the chances of discovering more far-off blazars. The research team was led by Vaidehi Paliya and Marco Ajello at Clemson University in South Carolina and included Dario Gasparrini at the Italian Space Agency's Science Data Center in Rome as well as Ojha. They began by searching for the most distant sources in a catalog of 1.4 million quasars, a galaxy class closely related to blazars. Because only the brightest sources can be detected at great cosmic distances, they then eliminated all but the brightest objects at radio wavelengths from the list. With a final sample of about 1,100 objects, the scientists then examined LAT data for all of them, resulting in the detection of five new gamma-ray blazars. Expressed in terms of redshift, astronomers' preferred measure of the deep cosmos, the new blazars range from redshift 3.3 to 4.31, which means the light we now detect from them started on its way when the universe was between 1.9 and 1.4 billion years old, respectively. "Once we found these sources, we collected all the available multiwavelength data on them and derived properties like the black hole mass, the accretion disk luminosity, and the jet power," said Paliya. "The main question now is how these huge black holes could have formed in such a young universe," said Gasparrini. "We don't know what mechanisms triggered their rapid development." "We think Fermi has detected just the tip of the iceberg, the first examples of a galaxy population that previously has not been detected in gamma rays," said Ajello. Newer PostExplainer: What is a planet?